The first article on our #StartupBharat series shines the spotlight on innovations from Tier II and III cities and towns across India. This week, we feature Dr Kiran Kanthi of Lifetron Innov Equipments. The startup, incubated at Sandbox Startups in Hubli, Karnataka, has built a portable, affordable solution to treat jaundice in newborns. It has the potential to save lakhs of young lives that are tragically lost each year to lack of access to treatment. “Over 8 lakh newborn babies die in India every year. Many from neonatal jaundice. If they get the right treatment at the right time, they can be saved,” Dr Kiran Kanthi tells me on the phone when I call him up to find out more about a new product he’s built, which can save lakhs of lives. While this is easily available in most large hospitals, newborns in rural areas often don’t have access to this facility, which can easily prevent unnecessary deaths. A practicing anaesthesiologist, Kiran has also been running a neonatal nursing care centre for over 20 years in Bagalkot, North Karnataka. His nursing home is one of the few in rural Karnataka that has a neonatal intensive care unit equipped with phototherapy treatment. “The equipment available in the market today is expensive and heavy. It needs a compulsory neonatal intensive care (NICU) setup, where the baby has to be separated from the mother and kept under care. And this kind of care isn’t easily available in rural areas,” Kiran explains. According to a UNICEF report, India ranks number 12 in the world in neonatal mortality. Having seen the tragedies that occur due to lack of access to timely treatment, he felt that the best way to save babies who need treatment was to get the equipment right their homes And that’s what led him to set up Lifetrons Innov Equipments, a medtech startup, in Hubli, Karnataka, in 2016. The concept was simple enough: a low-cost, portable, bedside neonatal phototherapy unit that can be used in any kind of rural or remote healthcare setup. But Kiran is a doctor, not an engineer. He was clear about what the product had to be. But the process of manufacturing a phototherapy unit included many steps and even more challenges. First, Kiran created a rudimentary design and took it to a team of engineers. But explaining himself was easier said than done. He worked on the design for three years. He learnt about different moulds available in the market to manufacture medical equipment and about the kind of CAD designs to help build the right models and to decide which materials would work best. “I hired two CAD designers and two engineers. One of the two engineers is from Bengaluru, the rest are from Hubli,” says Kiran. It was while talking to different people and working on the prototype that Kiran met C.M. Patil, who runs the Deshpande Foundation Sandbox Startups, an incubator in Hubli. This was in March 2018. It is here that the team has set up its lab and equipment. From there on, the product received the technical expertise it needed. 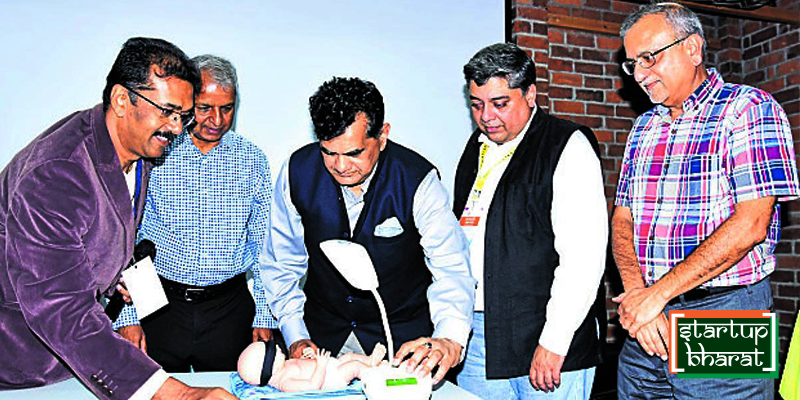 And last March, Lifetrons’ equipment was inaugurated by NITI Aayog CEO Amitabh Kant. Many of the raw materials, like the injection mould that the team uses to build most of the base equipment, come from Hubli, while the electronics are sourced from Bengaluru. The team is currently building an assembly line at Sandbox for its go-to-market exercise, scheduled over the next few weeks. Lifetron’s patent-pending phototherapy unit costs Rs 30,000, which is half the cost of the existing ones that go for Rs 60,000. The product has full battery backup and can easily be used in primary health care centres. It has undergone clinical trials in Hubli and at Kiran’s nursing home. The team has also applied for certification for its equipment with the Indian Certification for Medical Devices and other bodies. India has its fair share of healthcare equipment startups, including Forus Healthcare, Cyclops Medtech, InnAccel, and Sattva Medtech. The healthcare industry is part of a market worth $160 billion in 2017 and set to cross $280 billion by 2020, according to an IBEF report. The need for reliable medical devices in the country is also growing. There are larger organisations like GE Healthcare, Phillips and Davin building portable equipment too, but not many are available in remote rural areas. Lifetron is trying to change that.